Believe it or not, St. Patrick’s Day is just around the corner! That means that if you’re planning to take your Irish decorations to the next level this year with a customized St. Patrick’s Day flag or banner, now’s the time to get to work on designing and ordering your masterpiece. Wondering where to begin when it comes to designing a personalized St. Patrick’s Day flag or marching banner for an upcoming parade? We’ve got you covered! Read on for tips and how-tos to guide you through the process of creating your own custom St. Patrick’s Day flag or parade banner. There are a few easy steps you’ll need to follow to successfully design and order a customized Irish flag or banner for St. Patrick’s Day. What will you be using the flag or banner for? Is what you’re designing going to be a decoration for your home, or will you be marching in a parade with it? Will you be displaying your custom St. Patrick’s Day flag outdoors, or indoors? Knowing what you’ll be using your flag or banner for will help you to determine the materials that should be used to make the flag and may inform the design you ultimately decide to use. As such, this is a good first step to take as you approach creating a custom flag or banner. What’s the design you have in mind? Do you have a specific look in mind for your flag or banner? Are you creating something completely customized, or will you be trying to replicate the look of another St. Patrick’s Day product you saw and liked with a bit of personalization added in? Having a good sense of the design you’d like to create will help to give you direction and narrow your options a bit as you’re brainstorming. 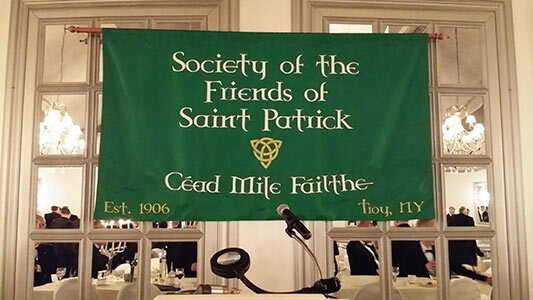 Do you have a set budget in mind for creating your custom St. Patrick’s Day flag or parade banner? Determining how much you are willing to spend will help you to figure out what’s feasible in terms of your custom design, flag or banner size, material, and more. Once you have a good sense of what you’d like to create in terms of a custom St. Patrick’s Day flag or banner, the next step is finding a flag maker to work with to make your design concept a reality. At Gettysburg Flag Works, we’ve been working with customers to create custom flags, banners, sashes and more for decades. We know what it takes to get the job done – and get it done well! Our team of designers and production staff can help you take your design from vision to reality, guiding you every step of the way. Thinking of designing a marching banner for the St. Paddy’s Day parade? We’ve worked with dozens of AOHs and other organizations who march in local parades each year! Our team has created many custom parade banners as well as personalized parade sashes for these groups – and we’d be happy to work with you to do the same! If you’re in the market for a customized St. Patrick’s Day flag or parade banner, keep us in mind! You can learn more about our custom flag creation process here. We know that cost is an important factor when it comes to designing custom flags and banners. You want to be sure you’re showing your Irish pride without breaking the bank! 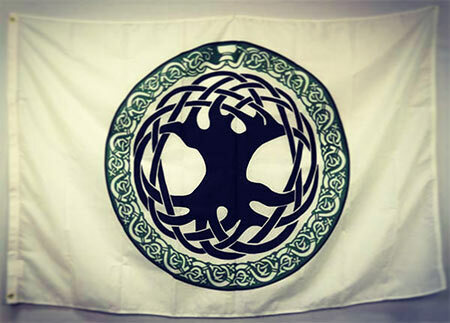 Before moving forward with creating your custom St. Patrick’s Day flag or banner, be sure to request a quote for the project from the flag maker you’ve selected. 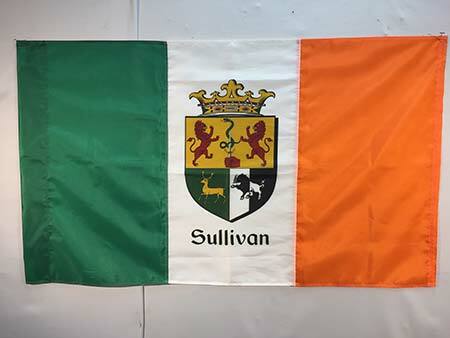 Interested in a quote for a personalized Irish flag or banner from Gettysburg Flag Works? You can request one here. Once you’ve settled on a design, found a flag maker and received a quote you’re happy with, it’s finally time to place your order for your custom St. Patrick’s Day flag or parade banner! Curious about what placing your order entails? We have an easy four step process for ordering custom products. Review the process here so you know what to expect. Before your custom St. Patrick’s Day flag or banner is finalized, you’ll have a chance to do a final review of the artwork. Check it over carefully to make sure it’s exactly what you’d envisioned. Once this proof is approved, your flag or banner will be moved into production and will be delivered to you before you know it! Order Your Custom St. Patrick’s Day Flag or Parade Banner Today! 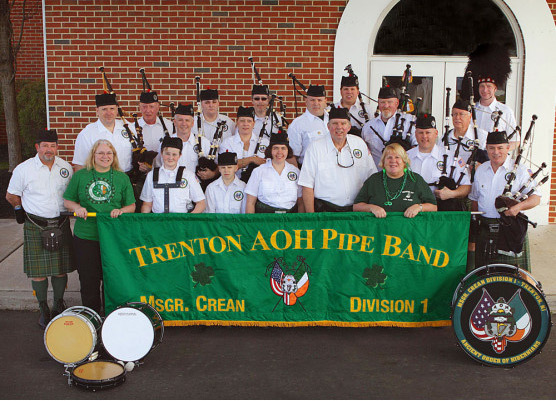 If you’re hoping to show your Irish spirit this year with a customized parade banner or St. Patrick’s Day flag, now’s the time to place your order! Ready to get started? Request a quote for your customized St. Patrick’s Day flag or parade banner design here. Have questions? Give us a call at 1-888-697-3524 or contact us online and we’d be happy to help you out! Looking for some inspiration? Designing a custom flag can be challenging. After all, the possibilities are just about endless! With so many options, it can be tough to decide exactly what you like and don’t like as you’re envisioning your St. Patrick’s Day flag or parade banner. We have a few options to help make creating a customized Irish flag or banner easier. Customizable Ireland Flag – This flag features the colors of Ireland with a family initial or symbol that speaks to your Irish heritage. Numerous customization options within a basic design layout make this a great option if you need a little bit of structure when it comes to developing your vision. Custom Parade Banner Portfolio – Our portfolio features marching banners we custom created for other organizations. Browse the selection for inspiration and ideas you can incorporate into your own St. Patrick’s Day parade banner design. Personalized Custom Products – Like we said, the possibilities are just about endless when it comes to custom flags and banners. Here, you can view a collection of the various products we’re able to customize and personalized. If you’re hoping to design something completely unique, this may be a good place to get started. Marching in a St. Patrick’s Day parade for the first time this year? Check out our guide to everything you need to know about marching in a St. Patrick’s Day parade so you’re well prepared for the experience!